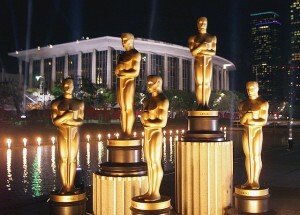 Home » Latest News » 135 Days ’til Oscar: Remember the Dorothy Chandler Pavilion? 135 Days ’til Oscar: Remember the Dorothy Chandler Pavilion? Occasionally while typing about the Oscars I accidentally type in the Shrine or the Kodak and especially “The Dorothy Chandler Pavilion” when I mean The Dolby Theater. It’s an honest mistake since the Oscars are a bonafide institution and one tends to associate locations with events. The Dolby Theater, the “permanent” home now for Oscar (whatever permanent means considering things such as contracts, name changes, and rights battles for broadcast and whatnot) was once the Kodak Theater and for the last dozen years that’s where the Oscars have been held. But until the new millenium, I associated the event with the Dorothy Chandler Pavilion. That music hall hosted the Oscars the longest from Oliver! (1968) through Shakespeare in Love (1998) though it should be noted that the Shrine auditorium stepped in as substitute for six years during that three decade stretch. I’ve never actually been to the Dorothy Chandler Pavilion but for a young movie mad boy in the suburbs of Detroit in the Eighties, 135 North Grand Avenue was the most important address in the world, way cooler than 1600 Pennsylvania Avenue. I still think of it as way more glamorous than the Dolby… but maybe that’s because I’ve been to the Dolby and though it looks great on TV it’s inside a shopping mall. Perhaps that’s appropriate for a golden idol that’s really only gold-plated.